PRESS RELEASE: This August, if you buy a qualifying Røde mic from a participating dealer, you can claim a Vicoustic Flexi Screen Lite and a Røde SM6 Shockmount/Pop Screen for the equivalent of just 60p…delivered! Source Distribution is thrilled to announce v2.0 of last summer's Rode $1 deal, which kicks off on August 1st. • During August only, if you purchase a qualifying Røde microphone from a participating dealer in the UK & Ireland, you are entitled to claim a Vicoustic Flexi Screen Lite and Røde SM6 combined shockmount/popshield (together worth over £100) for just 60 pence. • The qualifying mics for the promotion are the Røde NT1000, NT2A, NT2000, NTK, K2 and Classic II. 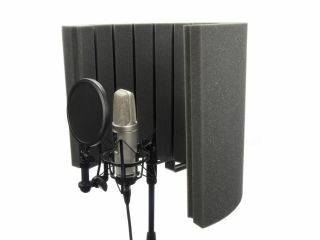 • To get the SM6 and Flexi Screen Lite, just purchase a qualifying mic from a participating dealer in August, and with the serial number of the unit and sale details in hand, just visit http://uk.rodemic.com/onedollardeal. • You fill out the details and pay Røde $1AUD (approx 60 pence) through their simple secure online form. • Source Distribution then verifies the sale and dispatches the Flexi Screen Lite and SM6 directly to you - carriage free. Simple! Hurry - the promotion is only available for a month, and please note that the SM6 is an extra gift that Source Distribution is offering itself to sweeten the deal - so it's available only through participating dealers in the UK & Ireland! For full details and a list of participating dealers simply visit: http://uk.rodemic.com/onedollardeal.